I think I was shocked the first time I learned that not everyone loves chocolate-covered cherries as much as I do. To me, they just are the ultimate flavor--the tart burst of cherry, almond-like liqueur, and rich dark chocolate all around it. But for some reason there are people who are just not fans. And you know what I say to that? This past weekend, Eugene and I drove to my parents' house in New Jersey to celebrate their anniversary with a casual bbq in their backyard. My dad asked me to bring some baked goods, so I decided to play around with those cherry and chocolate flavors that I love, and made this cake. 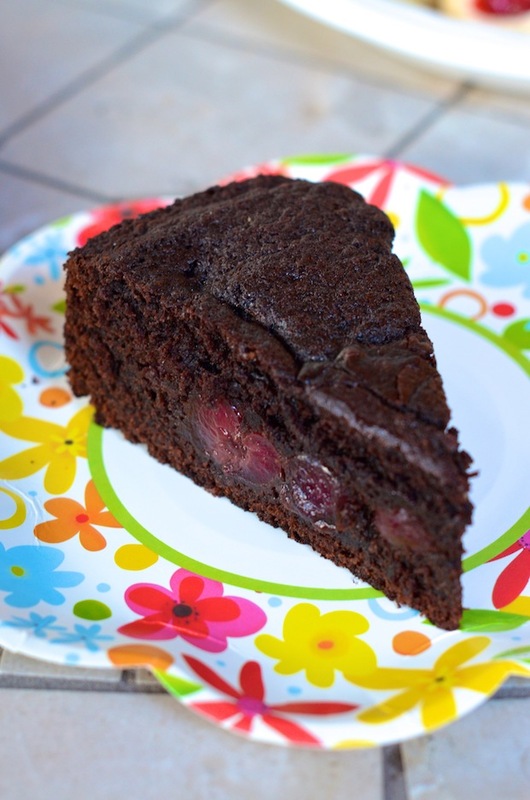 The combination of rich dark chocolate cake with a layer of fresh cherries baked right in is absolutely perfect! Pure almond extract added to the batter plays up those "cherry liqueur" notes. 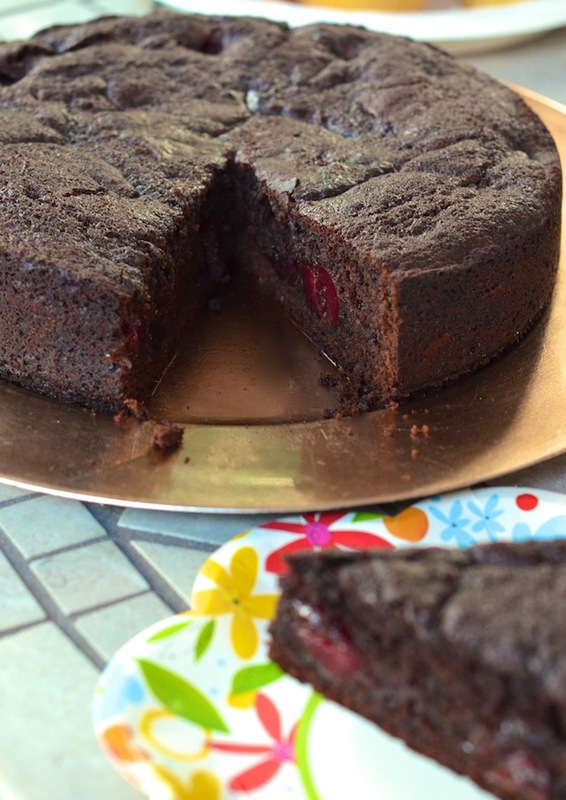 If you love chocolate-covered cherry candies, you will ADORE this cake. 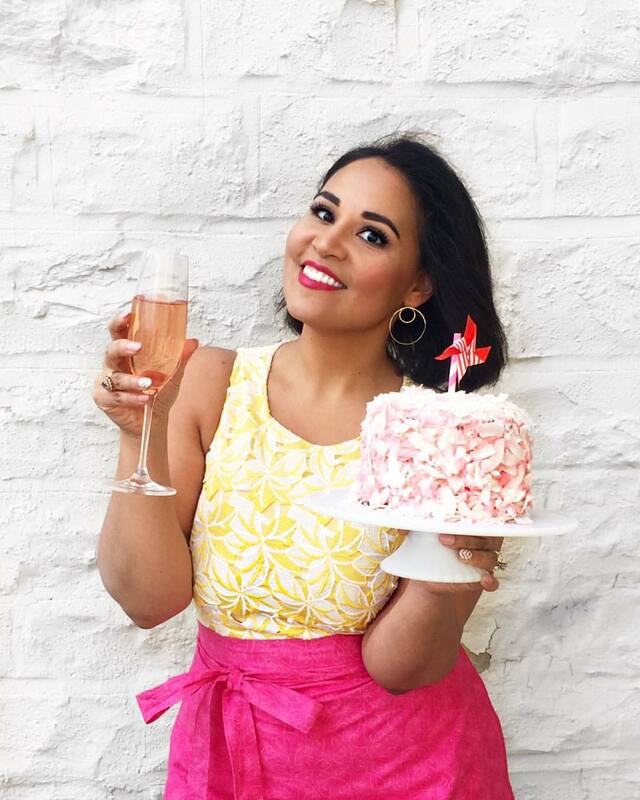 A few things to note about the cake. This calls for Dutched cocoa, which is different than regular cocoa as it has been alkalized. It also has a richer almost Oreo-cookie-like flavor. Definitely don't skip it! 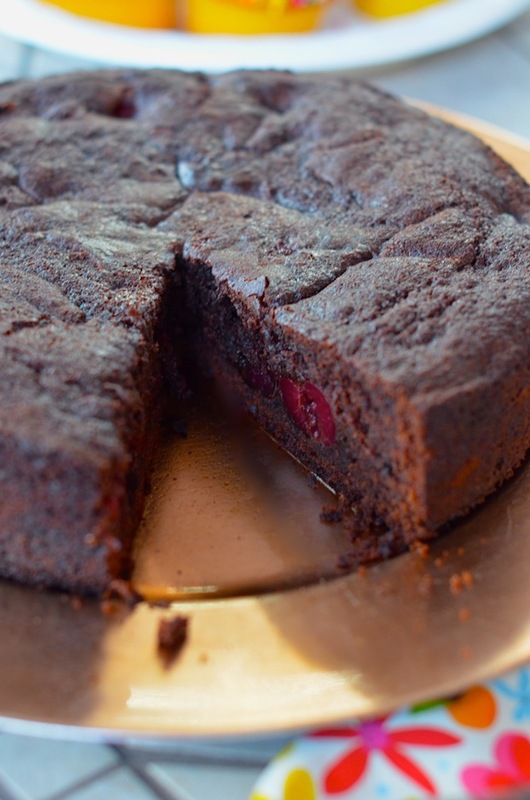 The cherries in this cake are fresh cherries. You want something like Bing cherries. Please do NOT use candied or jarred cherries--those will be way too sweet. It's all about that combo of tart and sweet here. In base of electric mixer, cream together butter and sugar until light and fluffy (about 2-3 minutes). Add the egg and beat additional 3 minutes. Add the yogurt, vanilla, and almond. Balance a mesh sieve over the bowl with the wet ingredients and pour in flour, cocoa powder, baking powder, baking soda, and salt. Sift dry ingredients into the chocolate base, and then stir until completely incorporated. Pour batter into prepared pan, spreading out evenly. 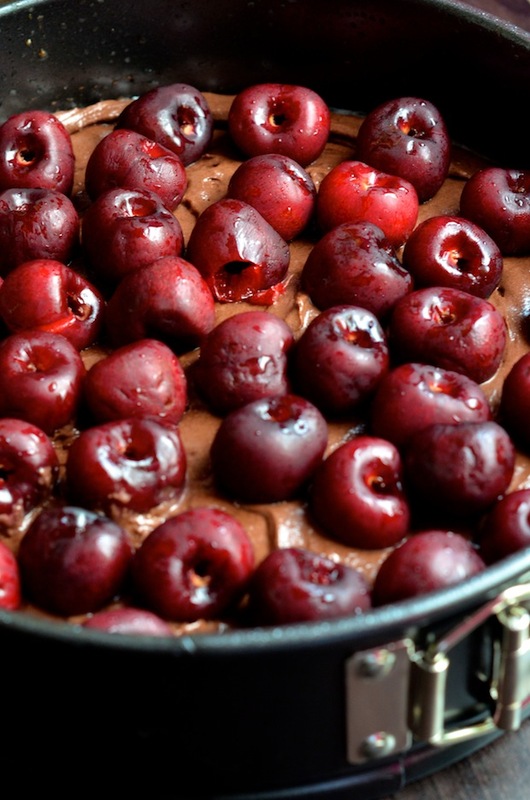 Top with cherries (it's ok if they layer on top of each other--they will sink during baking). Bake about 65 minutes or until a tester inserted in center comes out clean. Let cool in pan for 10 minutes before removing sides and transferring to a rack to cool completely.